Joe designed the house and did all construction work, probably with the help of his nephew, Paul. Murer did all the interior wood work in the house, such as the pillared bookcases columns (identical to those in the Folsom Hotel today) and built-in hutches. When the house was near completion in 1927, he hired Antonio Zanetta, another Italian immigrant, to plaster the interior and install the tile roof. Zanetta, a native of the Piemonte region in northern Italy, went on to work with Joe on other projects again doing the plastering and tile roofing. Antonio worked along and Joe would usually find an assistant or laborer from the hotel to work with him. His son, Fred Zanetta, would become a builder in Folsom and lives here still today. 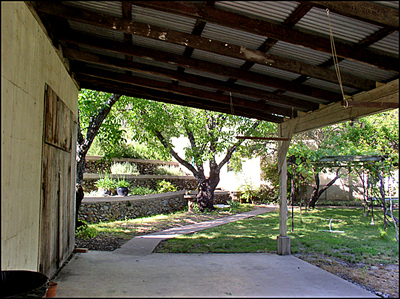 His contribution to the Folsom Historical Society, Zanetta’s Barn, sits behind the museum on Sutter Street today. Giuseppe "Joe" Murer purchased the site of the Murer house in 1921. 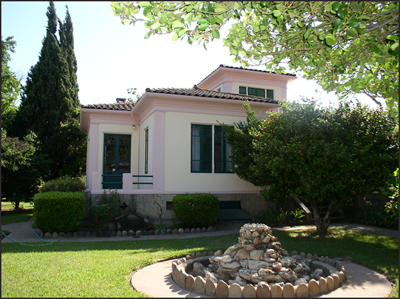 He started building his personal residence there in 1925 basing its design on the architecture from his native Italy. His property was bounded on the west by dredge tailings. To retain these tailings, he constructed terraces using the river cobbles, nestling the house back into a pile to maximize yard and garden space. Once the house, garage and workshop buildings were completed, Joe landscaped his property. The landscaping focused on fruit and nut trees (including an Italian staple, the chestnut), grapes and decorative ornamentlas, such as camellia and holly. Fruit trees included winter pear, bing cherry, apricot, pineapple guava, tanagerine, pomegranite, lemon and carob. Nuts included english walnut and hazelnut. Joe also built a grape arbor with six varietals of concord grapes in the backyard.